OSE_1309_part1_Layout 1 9/6/13 12:30 PM Page 1 Set Your Skin Prep Timers for 3:00 p. 14 Social Media: Fighting the Fear p. 26 GI Efficiency & Profitability Tips p. 90 Paradox of Being an OR Nurse p. 154 Outpatient Surgery www outpatientsurgery.net Magazine September 2013 R YES, HE REALLY THINKS YOU SHOULD Post Your Prices Online Listing all-inclusive prices for surgery on his website is only part of Dr. Keith Smith's radical plan to bring free-market economics to the U.S. healthcare system. P 46 . 2013 Awards Keith Smith, MD, co-founder of the Surgery Center of Oklahoma, is leading the effort to provide transparency in healthcare pricing. 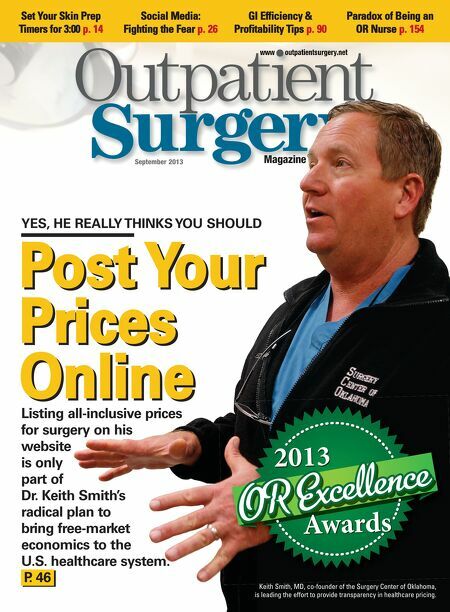 Is Surgery Ready for Price Transparency? Anesthesia Alert: Are Continuous Peripheral Nerve Blocks for You? Safety: Is It Time to Recall Your Recall Policy? Cutting Remarks: Secrets to Running 2 Rooms after 5 p.m.